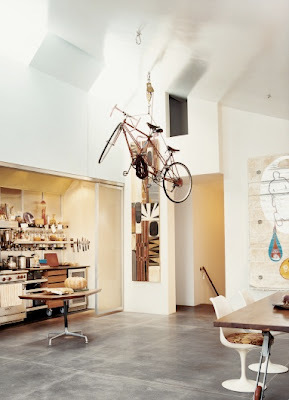 Okay so it's not exactly art, but architect/bike activist David Baker 's ceiling mounted bike storage is totally sculptural. I have ceilings similar to this in my place, and have been awkwardly parking my bike in my entryway since I had the air let out of my tires in the parking garage. This hook and pulley system might be a playful a practical answer to my parking dilemma. It does, mine are almost exactly like this. 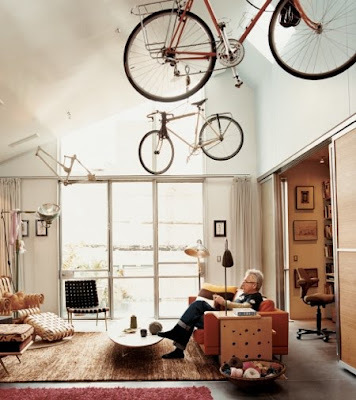 Although I'd be a bit nervous suspending a bike above my couch.